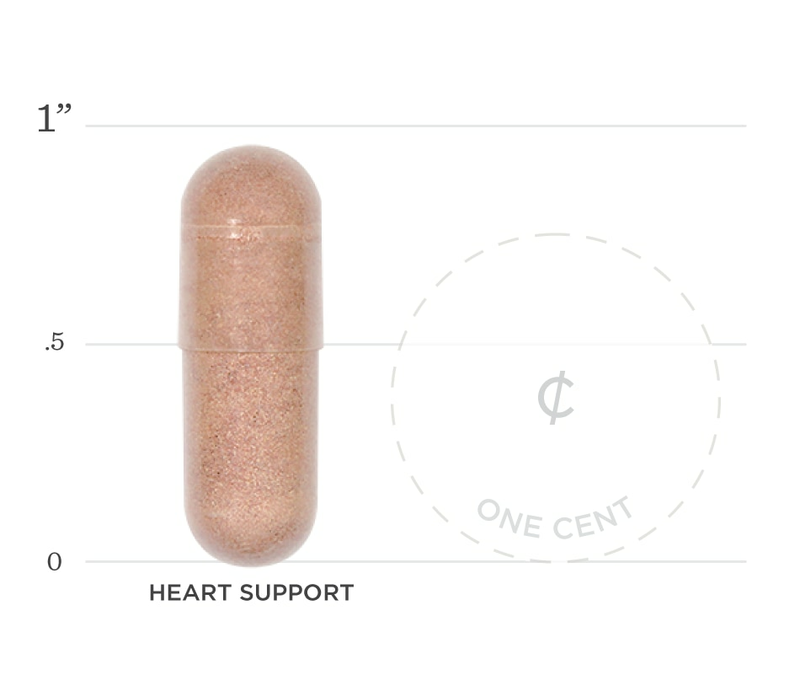 Red yeast rice found in our Heart Support contains monacolin K, the same active ingredient found in many cholesterol-lowering medications. Red yeast rice has been used in traditional Chinese medicine for centuries because of its powerful medicinal properties. Our red yeast rice is combined with CoQ10 to support a healthy inflammatory response. 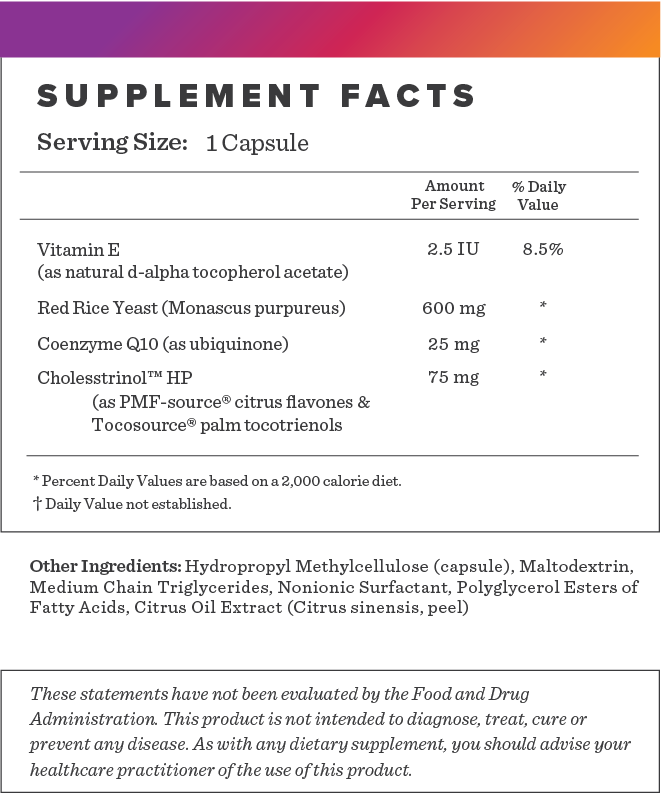 Red yeast rice contains monacolin K, the same ingredient in cholesterol lowering medications. High cholesterol levels can lead to clogged arteries, raise your risk of heart disease, heart attack, and stroke. 1. Prakash S, Sunitha J, Hans M. Role of coenzyme Q(10) as an antioxidant and bioenergizer in periodontal diseases. Indian J Pharmacol. 2010;42(6):334-7. 3. Becker DJ, Gordon RY, Halbert SC, French B, Morris PB, Rader DJ. Red yeast rice for dyslipidemia in statin-intolerant patients: a randomized trial. Ann Intern Med. 2009;150(12):830-9, W147-9. Cholesstrinol HP (as PMF-source® citrus flavonoids & Toco Source® palm tocotrienols), Coenzyme Q10 (as ubiquinone), Red Rice Yeast (Monascus purpureus), Vitamin E (as d-alpha Tocopheryl Acetate) , Hydroxypropyl methylcellulose (capsule), maltodextrin, medium chain triglycerides, nonionic surfactant, polyglycerol esters of fatty acids, citrus oil extract (citrus sinensis, peel). Below we've broken down the main functions of our Heart Support and the benefits it can provide. Coenzyme Q10 is conveniently located in parts of the cell that are prone to oxidative damage and works as an antioxidant to protect the body from free radicals. Studies have indicated that CoQ10 and red yeast extract can protect the heart and even reduce the risk of major cardiovascular events in those with heart failure. A randomized controlled trial revealed red yeast rice improved LDL cholesterol without affecting HDL levels. The authors concluded that it is an effective treatment to help lower cholesterol levels.